The fish in the Western and Central Pacific provides more than half of the world's tuna. This video from PNC News discusses what went on at today's WCPFC meeting. 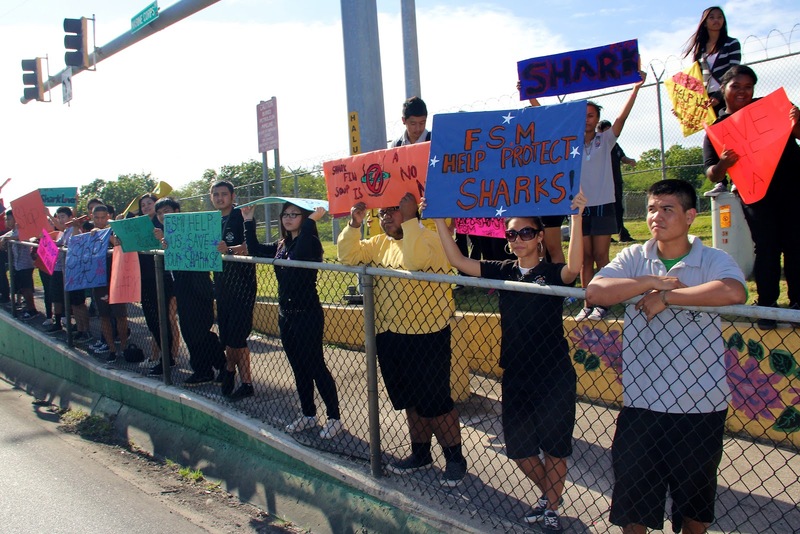 Students from Simon Sanchez HS, George Washington HS, and John F Kennedy HS show off their art project "Shark Fins in the Sand" at Ypoa Beach on Saturday, March 24. The students created 730 handmade shark fins to represent the 73 millions sharks killed each year for their fins. Each fin represents 100,000 sharks, the number of sharks killed every 12 hours. 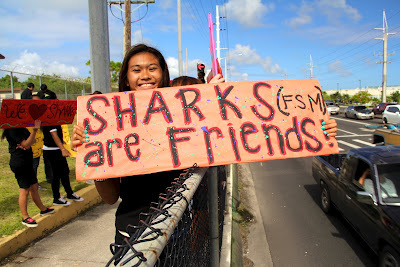 Around the world, Micronesia is fast becoming known as home to the world’s first shark sanctuary, the world’s largest shark sanctuary, and thanks to Guam and the Northern Mariana Islands, the second and third shark fin trade bans in the world, respectively. 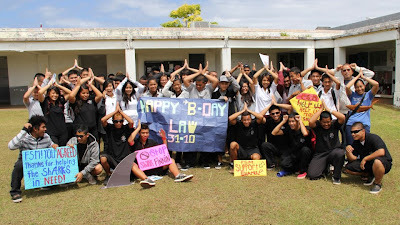 Micronesia leads the world in shark conservation, both in terms of the area of ocean protected, implementation and enforcement of policies, and fines levied against lawbreakers. This leadership is an inspiration to the rest of the world. 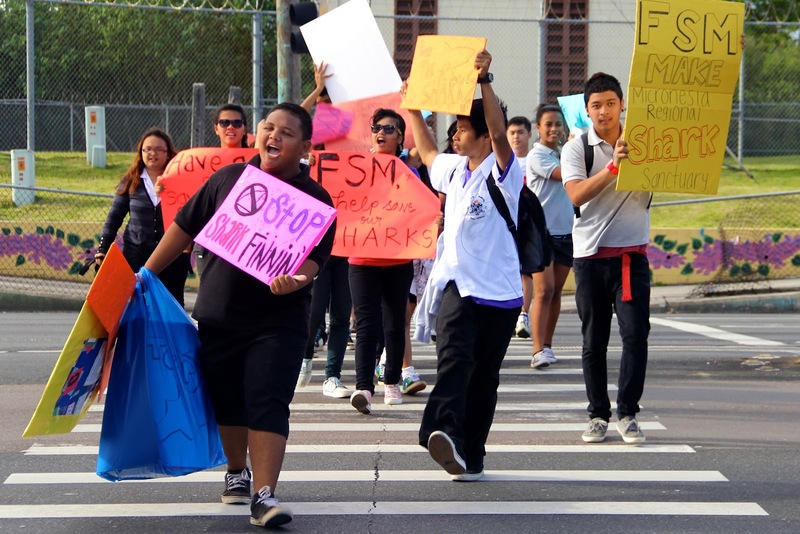 Last year, following the laws passed in Guam and Northern Mariana Islands, the entire west coast of the United States banned the sale, trade, and possession of shark fin. 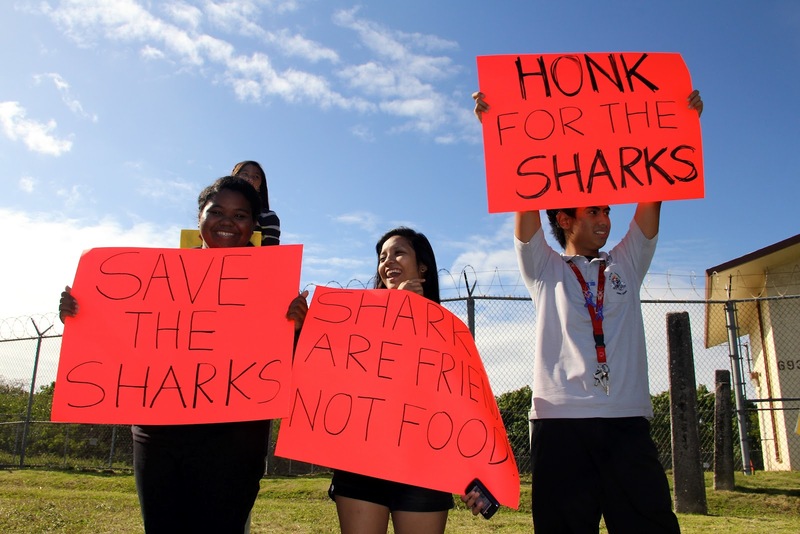 Shark fin trade bans were also passed in the Canadian municipalities of Brantford, Mississauga, Oakville, Pickering, London, and Toronto. In the last few months, similar laws have been introduced in legislatures in Florida, New York, Maryland, Virginia, and even land-locked Illinois. Stirred by Palau’s 2011 landmark declaration of the world’s first shark sanctuary, in 2011 The Bahamas, Tokelau, Honduras, and the Marshall Islands declared shark sanctuaries, ending commercial shark fishing in their countries’ full exclusive economic zones. The shark sanctuary in the Marshall Islands is 1,990,530 square kilometers, an ocean area four times the landmass of California. Worldwide interest in sharks has boomed in recent years, and dive enthusiasts are willing to travel thousands of miles and spend thousands of dollars to swim with these creatures. Palau, of course, is well known for dive sites that sharks frequent on a daily basis. A recent study found that this shark diving accounts for fully 8% of Palau’s annual GDP. It is only a matter of time before the world discovers the rest of Micronesia and the other shark and ray dives throughout your islands. Congratulations to everyone involved on our one-year anniversary in creating policies to protect sharks. Thank you to our senators for working with the community to draft science driven, culturally sensitive policy, thank you to Governor Calvo for signing this important legislation into law, and thank you to all the citizen activists, especially the students at Simon Sanchez High School, George Washington High School, and John F. Kennedy High School for your infectious energy. Working together, with local citizens teaming up with international organizations like Humane Society International, Shark Savers, and the Pew Environment Group, we can protect the world’s sharks from extinction. I hope this works. We haven't done as good a job using Flickr as we should (mostly we upload photos to Facebook and/or Blogger). So here's an embedded widget with photos from the sand shark sculpture contest held on Guam this weekend (and here is the link if the widget doesn't work on your computer). 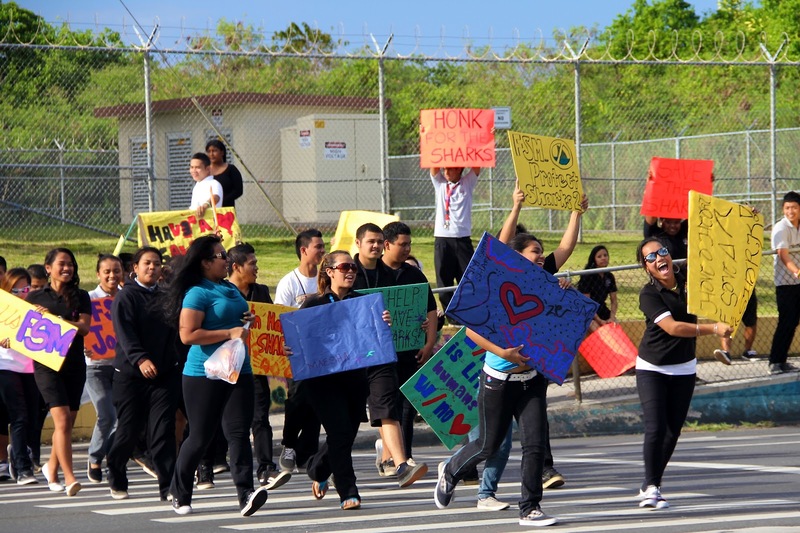 Guam is celebrating the one year anniversary of their shark fin ban and students have been reminding their community how important sharks are to the ecosystem. Students from Simon Sanchez High School held a road side "wave" two weeks ago, and today students from Simon Sanchez, George Washington, and John F. Kennedy High Schools collaborated on "Shark Fins in the Sand," an art project to depict how many sharks are killed each year. 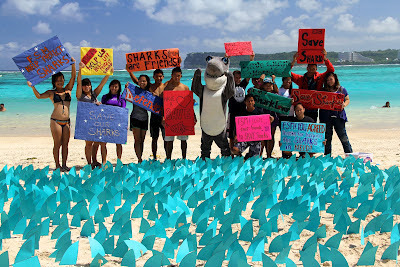 The students created 730 handmade shark fins to represent the 73 million sharks estimated to be killed each year (Clarke et al, 2006). Each fins represents 100,000 sharks, the number of sharks killed every 12 hours. The Fiji Police Rugby League team's preparation for the local competition has been boosted with a timely donation of a set jerseys and shorts by Coral Reef Alliance. Founded in 1994 the Coral Reef Alliance is an international non-profit organisation dedicated to protecting the health of coral reefs. It is working in partnership with the Pew Environment Group and the Ministry of Fisheries in raising awareness for shark protection in Fiji. In presenting the jerseys, the "Shark Man" or the voice of the sharks in Fiji Manoa Rasigatale said his organisation was happy to be associated with the Police Rugby League team. He added that his organisation hoped their relationship with police would be strengthened and police would be a great partner in the conservation of sharks in Fiji. Commissioner of Police Brigadier General Ioane Naivalurua thanked the sponsors for their kindness and assured them police will spread the message of shark conservation in Fiji. "The work of police officers now covers a wide range of issues, and one of importance is that of policing the environment". He then advised the sponsors to use the police network in facilitating the conservation of sharks . "You have my assurance that our officers will help spread the message of the importance of protecting sharks and our environment both on and off the field". 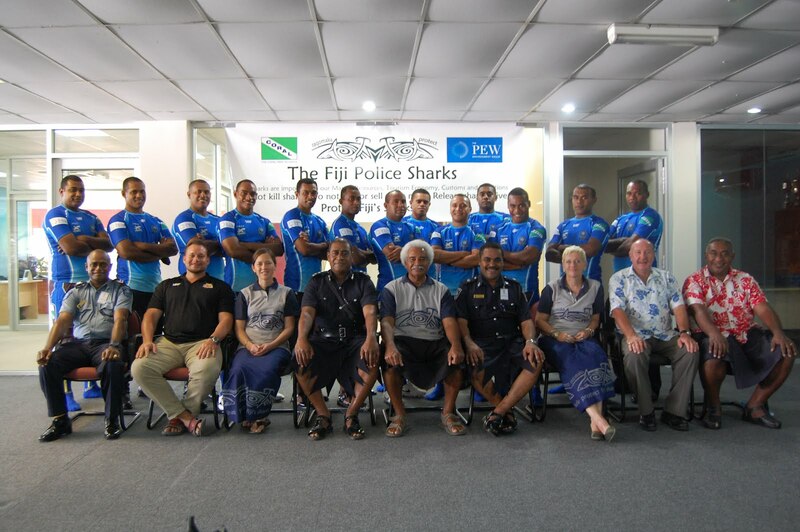 Police Rugby League team official Aporosa Lutunauga said the team embraces the partnership with Coral Reef Alliance and they will support their effort in shark conservation. He adds this was also part of their corporate responsibility in giving back to the community and our environment. The Fiji Police Rugby League team is the current holders of the World Police Rugby League Cup, and is scheduled to defend their title next year. 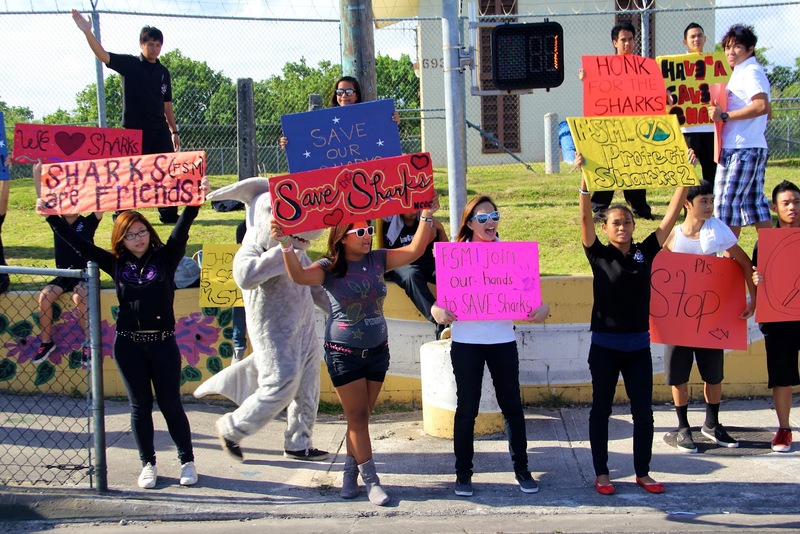 In celebration of the one year anniversary of the Guam Shark Finning Ban, UnderWater World will be hosting Guam's first Sand Shark Building Contest this weekend. The Sand Shark Building Contest will be from 9 a.m. to 11 a.m. Saturday, March 24, at Ypao Beach Park. Registration is free and open to students in grade 1 through 12. The contest is limited to the first 100 participants. Students can register at 9 a.m. at the lifeguard stand. Participants must have a parent or guardian present and complete liability waiver. The contest will have an Elementary category and a Middle and High School category. The top three Sand Sharks from both categories will receive cash prizes. All participants will receive a free pass to UnderWater World. Students can work in teams of up to four people but may not have adults help them with the building. UnderWater World is dedicated to offering quality family education and entertainment for the entire island community as a local business and member of the Guam Environmental Education Committee. UnderWater World® features an 800,000-gallon aquarium with a 319-foot tunnel. The entire aquarium experience is more than 600 feet long and home to more than 2,000 animals. The aquarium is home to sharks, stingrays, guitarfish and giant groupers. For more information about UnderWater World’s Education Programs or to arrange an interview please contact Elaina Todd at 649-9191 extension 120, or at 977-0359. 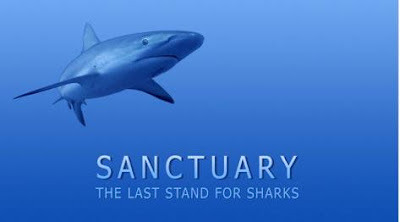 This Saturday March 17, the 20th Washington, D.C. Environmental Film Festival will host a screening of Sanctuary: The Last Stand for Sharks, a new documentary that portrays the underwater world of these top predators and paints a global picture of the threats they are facing today. 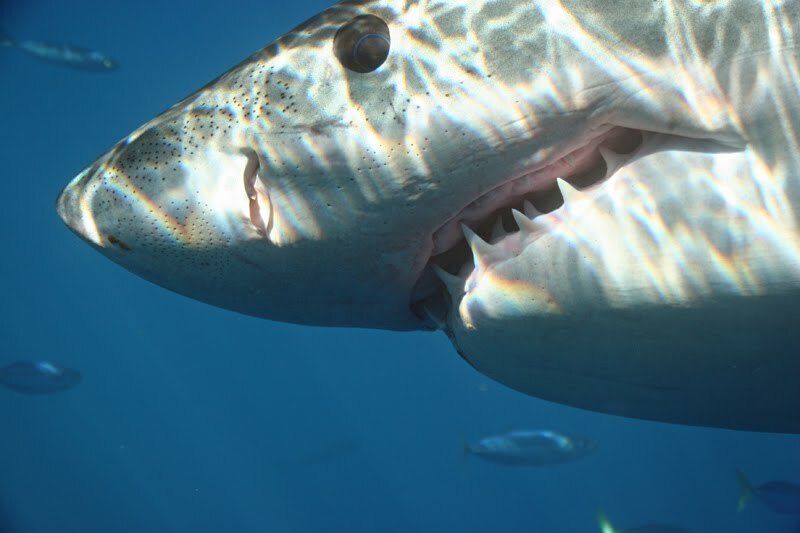 Globally shark populations are declining, but there is growing momentum to protect sharks. Filmed, produced, and written by John Weller and Shawn Heinrichs. The film screening will be followed by a discussion led by Matt Rand, Director, Global Shark Conservation, Pew Environment Group. Exciting news! 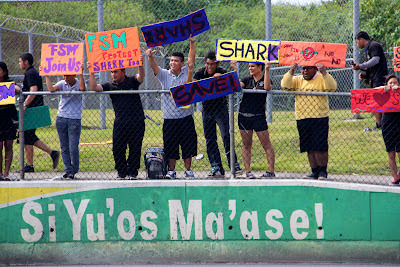 We just got word that Sharkwater Saipan has been accepted as an entry into the 2012 Beneath the Waves Film Festival in Norfolk, Virginia. We are honored to notify you that your film, “Sharkwater Saipan” was selected for showcase at this year’s main event on March 23, 2012, in Norfolk, Virginia. Your film was chosen because it combined elements of storytelling, research, and conservation. We are excited to show your piece to a large audience of marine scientists next week. Our film festival is also going on tour in the US and abroad in the Summer and Fall 2012. Next week we will have all of the films being shown simultaneously in two rooms (an IMAX theatre, and a smaller theatre), in two successive 90-minute sessions. An official schedule will be available online shortly. Your film will be reviewed at the event by a panel of judges for the “Best Message” and “Best Amateur Film” awards. There will also be a People’s Choice award for the films screened in the IMAX theatre. We'll have more information in the upcoming days, but wanted to let all of you know that we've been entered. More information is available on the Beneath the Waves website. We want to thank our collaborators on this project. Rob Stewart directed, Shawn Heinrichs filmed, and Duane Trow edited. 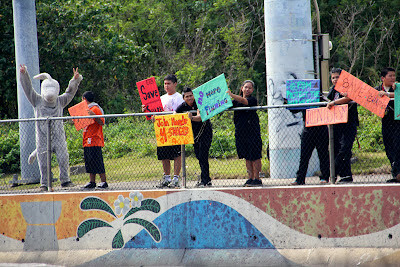 Of course, Kathy Pagapular's 6th grade class at San Vicente Elementary School starred. Congrats and thanks! On March 9, 2011, Guam became the third place in the world to ban the sale, trade, and possession of shark fin, after similar laws were put in place in Hawaii and Northern Mariana Islands. 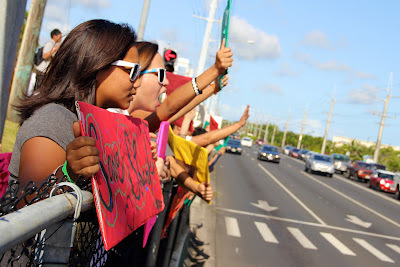 Yesterday, on the one year anniversary on the signing of the law, students from Simon Sanchez High School in Yigo, Guam held a rally at the busy intersection across from the Micronesia Mall. 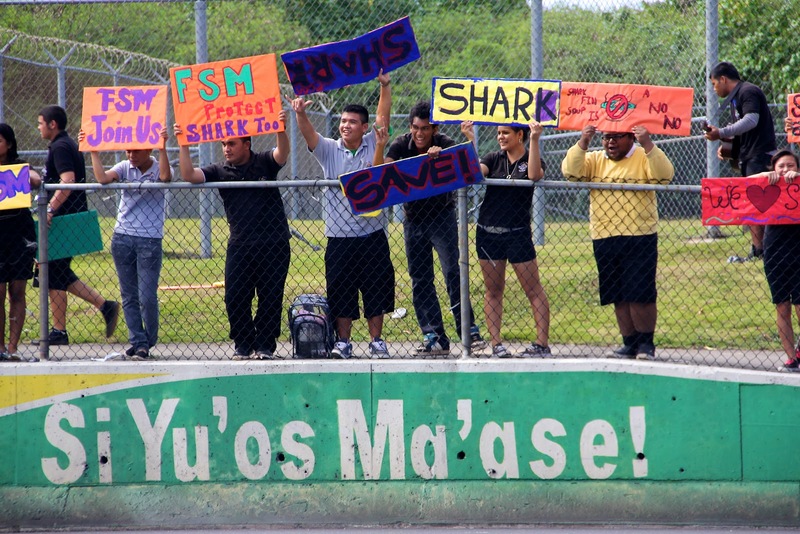 The students want to see the creation of a Micronesia Regional Shark Sanctuary that would stretch from Palau in the West, the Marianas in the North, and the Marshall Islands in the East. 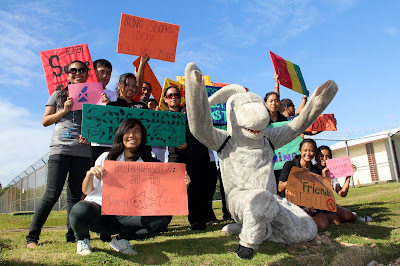 The students, along with other students in Palau, Yap, Chuuk, Pohnpei, Kosrae, Majuro, and Saipan, have been collecting signatures on a petition asking President Manny Mori and the four governors of the four states of the Federated States of Micronesia to complete the final piece of the regional shark sanctuary. The students hope to turn over their petition, along with signatures from students from the other islands, next week at the Micronesian Chief Executive Summit. Palikir, Pohnpei, FSM—Congress is considering a resolution that would request the President of the FSM and the four State governments to take action to declare the FSM exclusive economic zone as a marine sanctuary. In the Western and Central Pacific Ocean the FSM EEZ is second in size only to the EEZ of Kiribati. It is a huge area of ocean comparable in size to the entire land mass of the Continental United States. The resolution, which has not yet come to a vote in the FSM Congress, would be a Congressional declaration that the FSM EEZ is a marine sanctuary for sharks, rays, dolphin and, whales. It would urge President Mori to take necessary action to create the sanctuary and for the Governors of each FSM State to do the same for each of their 12 mile zones within the FSM EEZ. The resolution was sponsored by former FSM President, Senator Joseph Urusemal of Yap. 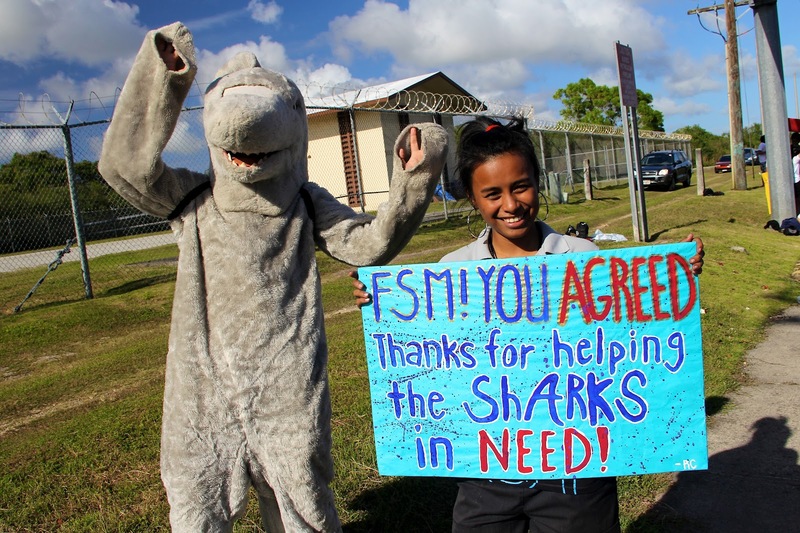 The resolution recognizes the important role that sharks, rays, dolphins, and whales play in the ocean’s ecosystem, as well as a significant part of the FSM’s cultural heritage and tourism throughout the FSM. It says that international agencies have indicated that the populations of sharks, rays, dolphins, and whales are in a worldwide decline. “Despite efforts to educate the public as to the disruption to the ocean’s equilibrium, sharks, rays, dolphins, and whales are still in decline,” the resolution says. If the FSM passes the resolution it would join “the international community in its commitment to ensure that sharks, rays, dolphins, and whales do not become extinct. Last year the Republic of Palau declared its waters to be a shark sanctuary and banned shark finning, in their EEZ. Written by Bill Jaynes and published in the Kaselehlie Press on February 22, 2011. 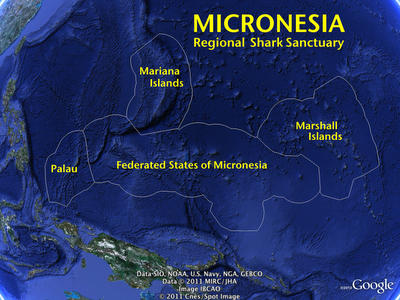 A shark sanctuary in the Federated States of Micronesia would create a contiguous area of ocean stretching from Palau in the west to the Marshall Islands in the east where sharks were protected. 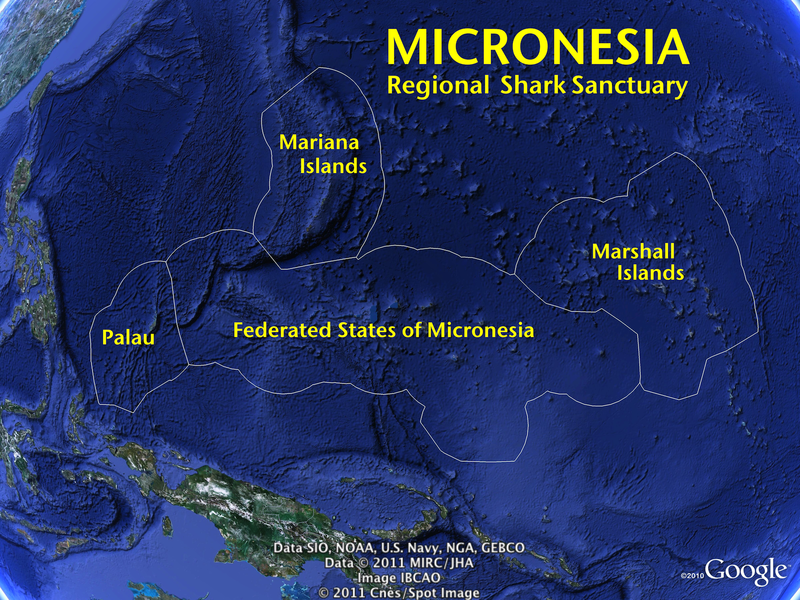 Leaders at the 15th Micronesian Chief Executive Summit in Pohnpei agreed to create a Micronesia Regional Shark Sanctuary. 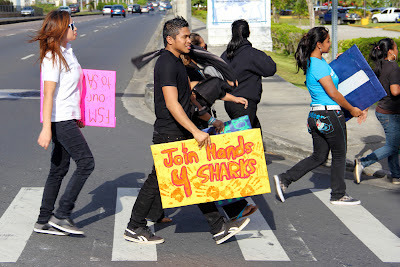 The Marshall Islands and Palau declared shark sanctuaries in 2009 and 2011, respectively, while Guam and the Northern Mariana Islands banned the sale, trade, and possesion of shark fin in 2011, the strongest protections they can implement as U.S. protectorates. 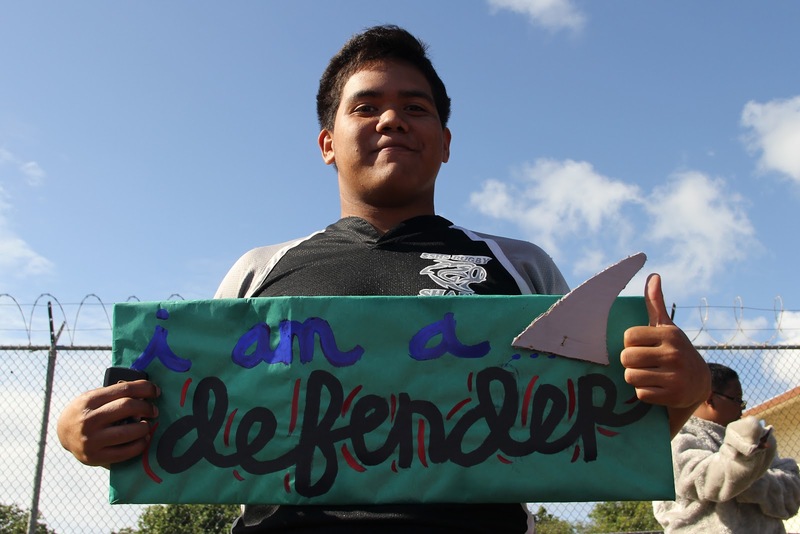 You can show your support by liking Micronesia Shark Defenders on Facebook. 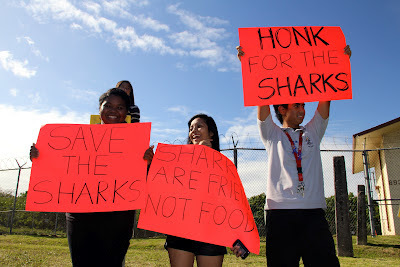 Shark Defenders is on Facebook, Twitter, Youtube, Flickr, and now we're on Pinterest. Please follow us! What's Your Favorite Shark Name? Here's a full list of common names of shark species (we're sparing you the latin names). Of the 480 species of sharks assessed by the IUCN Red List, 1/3 are threatened or near threatened with extinction. Nearly half lack the data needed to make an accurate assesment of their conservation status. We encourage you to learn about these shark species and their conservation status. It will make you a stronger advocate. You can read all about every single species of shark by navigating the IUCN Red List website at http://www.iucnredlist.org/. Run a search for CHONDRICHTHYES, and the results will pull up 1083 species of chimeras, rays, skates, guitar fish, and of course, sharks. So, what is your favorite common name for a shark species? Leave your answer and explain why in the comments of this blog post.